Creating a good input/output (I/O) system is one of the more difficult tasks for the language designer. // Displays directory listing using regular expressions. // Uses anonymous inner classes. // Building the anonymous inner class "in-place." // create directories and manipulate files. A pipe, which works like a physical pipe: You put things in at one end and they come out the other. A sequence of other streams, so you can collect them together into a single stream. Allows a buffer in memory to be used as an InputStream. The buffer from which to extract the bytes. As a source of data: Connect it to a FilterInputStream object to provide a useful interface. Converts a String into an InputStream. A String. The underlying implementation actually uses a StringBuffer. For reading information from a file. A String representing the file name, or a File or FileDescriptor object. Produces the data thats being written to the associated PipedOutput-Stream. Implements the piping concept. As a source of data in multithreading: Connect it to a FilterInputStream object to provide a useful interface. Converts two or more InputStream objects into a single InputStream. Two InputStream objects or an Enumeration for a container of InputStream objects. Abstract class that is an interface for decorators that provide useful functionality to the other InputStream classes. See Table 12-3. Creates a buffer in memory. All the data that you send to the stream is placed in this buffer. Optional initial size of the buffer. To designate the destination of your data: Connect it to a FilterOutputStream object to provide a useful interface. For sending information to a file. Any information you write to this automatically ends up as input for the associated PipedInput-Stream. Implements the piping concept. To designate the destination of your data for multithreading: Connect it to a FilterOutputStream object to provide a useful interface. Abstract class that is an interface for decorators that provide useful functionality to the other OutputStream classes. See Table 12-4. This doesnt provide an interface per se, just a requirement that a buffer be used. Attach an interface object. This just adds line numbering, so youll probably attach an interface object. Generally used in the scanner for a compiler and probably included because the Java compiler needed it. You probably wont use this. Should be the final wrapping for your OutputStream object. Youll probably use this a lot. Use this to prevent a physical write every time you send a piece of data. Youre saying Use a buffer. You can call flush( ) to flush the buffer. This doesnt provide an interface per se, just a requirement that a buffer is used. Attach an interface object. Here is a table that shows the correspondence between the sources and sinks of information (that is, where the data physically comes from or goes to) in the two hierarchies. In general, youll find that the interfaces for the two different hierarchies are similar if not identical. 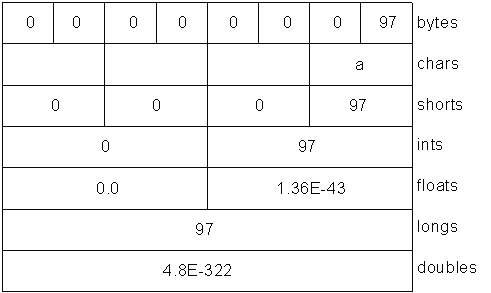 In the following table, the correspondence is a rougher approximation than in the previous table. The difference is because of the class organization; although BufferedOutputStream is a subclass of FilterOutputStream, BufferedWriter is not a subclass of FilterWriter (which, even though it is abstract, has no subclasses and so appears to have been put in either as a placeholder or simply so you wouldnt wonder where it was). However, the interfaces to the classes are quite a close match. Theres one direction thats quite clear: Whenever you want to use readLine( ), you shouldnt do it with a DataInputStream (this is met with a deprecation message at compile time), but instead use a BufferedReader. Other than this, DataInputStream is still a preferred member of the I/O library. DataOutputStream, in particular, is used without change, so for storing and retrieving data in a transportable format, you use the InputStream and OutputStream hierarchies. Most, if not all, of the RandomAccessFile functionality is superceded in JDK 1.4 with the nio memory-mapped files, which will be described later in this chapter. Although you can combine the I/O stream classes in many different ways, youll probably just use a few combinations. The following example can be used as a basic reference; it shows the creation and use of typical I/O configurations. Note that each configuration begins with a commented number and title that corresponds to the heading for the appropriate explanation that follows in the text. // Typical I/O stream configurations. Parts 1 through 4 demonstrate the creation and use of input streams. Part 4 also shows the simple use of an output stream. // Testing for end of file while reading a byte at a time. // a single string, and treating a file as an ArrayList. // How to read from standard input. // Turn System.out into a PrintWriter. // Demonstrates standard I/O redirection. System.out.println("Decoded using " + encoding + ": "
This corresponds to the output from the program. "[97, 0, 98, 0, 99, 0, 100, 0, 101, 0, 102, 0]"
Clears the buffer, sets the position to zero, and limit to capacity. 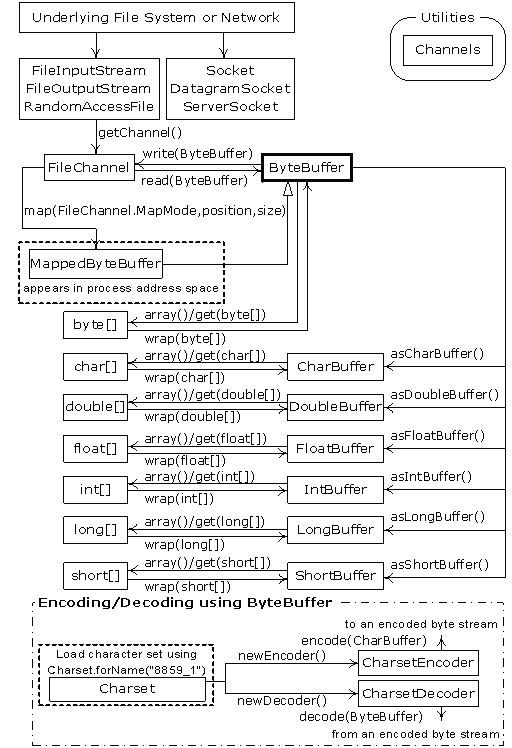 You call this method to overwrite an existing buffer. Sets limit to position and position to zero. This method is used to prepare the buffer for a read after data has been written into it. Returns the value of limit. Sets the value of limit. Returns the value of position. Sets the value of position. Returns true if there are any elements between position and limit. Methods that insert and extract data from the buffer update these indexes to reflect the changes. // Creating a very large file using mapping. Here is a simple example of file locking. // Locking portions of a mapped file. GetCheckSum( ) produces checksum for any InputStream (not just decompression). GetCheckSum( ) produces checksum for any OutputStream (not just compression). Base class for compression classes. A DeflaterOutputStream that compresses data into the Zip file format. A DeflaterOutputStream that compresses data into the GZIP file format. Base class for decompression classes. An InflaterInputStream that decompresses data that has been stored in the Zip file format. An InflaterInputStream that decompresses data that has been stored in the GZIP file format. Although there are many compression algorithms, Zip and GZIP are possibly the most commonly used. Thus you can easily manipulate your compressed data with the many tools available for reading and writing these formats. // number of files given on the command line. // No corresponding getComment(), though. // Checksum valid only after the file has been closed! Creates a new or empty archive. Lists the table of contents. Says: Im going to give you the name of the file. If you dont use this, jar assumes that its input will come from standard input, or, if it is creating a file, its output will go to standard output. Says that the first argument will be the name of the user-created manifest file. Generates verbose output describing what jar is doing. Only store the files; doesnt compress the files (use to create a JAR file that you can put in your classpath). Dont automatically create a manifest file. If a subdirectory is included in the files to be put into the JAR file, that subdirectory is automatically added, including all of its subdirectories, etc. Path information is also preserved. // Create a serialized output file. // class of object that's stored in that file. // Simple use of Externalizable & a pitfall. // Reconstructing an externalizable object. // s & i initialized only in nondefault constructor. // Demonstrates the "transient" keyword. // writeObject() and readObject() methods. // Saving and restoring the state of a pretend CAD system. Add a serializeStaticState( ) and deserializeStaticState( ) to the shapes. Remove the ArrayList shapeTypes and all code related to it. This program can be useful in testing regular expressions as you construct them to see that they produce your intended matching behavior. // Allows you to easly try out regular expressions. "innet nnet net et t s s wings wings ings ngs gs s "
public int groupCount( ) returns the number of groups in this matcher's pattern. Group zero is not included in this count. public String group( ) returns group zero (the entire match) from the previous match operation (find( ), for example). public String group(int i) returns the given group number during the previous match operation. If the match was successful, but the group specified failed to match any part of the input string, then null is returned. public int start(int group) returns the start index of the group found in the previous match operation. "m2.matches() start = 0 end = 35"
Two characters will be considered to match if, and only if, their full canonical decompositions match. The expression a\u030A, for example, will match the string ? when this flag is specified. By default, matching does not take canonical equivalence into account. By default, case-insensitive matching assumes that only characters in the US-ASCII character set are being matched. This flag allows your pattern to match without regard to case (upper or lower). Unicode-aware case-insensitive matching can be enabled by specifying the UNICODE_CASE flag in conjunction with this flag. In this mode, whitespace is ignored, and embedded comments starting with # are ignored until the end of a line. Unix lines mode can also be enabled via the embedded flag expression. In dotall mode, the expression . matches any character, including a line terminator. By default, the . expression does not match line terminators. In multiline mode, the expressions ^ and $ match the beginning and ending of a line, respectively. ^ also matches the beginning of the input string, and $ also matches the end of the input string. By default, these expressions only match at the beginning and the end of the entire input string. When this flag is specified, case-insensitive matching, when enabled by the CASE_INSENSITIVE flag, is done in a manner consistent with the Unicode Standard. By default, case-insensitive matching assumes that only characters in the US-ASCII character set are being matched. In this mode, only the \n line terminator is recognized in the behavior of ., ^, and $. Splitting divides an input string into an array of String objects, delimited by the regular expression. "[Aha!, String, has, a, split(), built, in!]" // A very simple version of the "grep" program. "[But, I'm, not, dead, yet!, I, feel, happy!]" Modify DirList.java to produce all the file names in the current directory and subdirectories that satisfy the given regular expression. Hint: use recursion to traverse the subdirectories. "Arline ate eight apples and one orange while Anita hadn't any"
 Design Patterns, Erich Gamma et al., Addison-Wesley 1995. Its not clear that this was a good design decision, especially compared to the simplicity of I/O libraries in other languages. But its the justification for the decision. XML is another way to solve the problem of moving data across different computing platforms, and does not depend on having Java on all platforms. JDK 1.4 contains XML tools in javax.xml. * libraries. These are covered in Thinking in Enterprise Java, at www.MindView.net. Chapter 13 shows an even more convenient solution for this: a GUI program with a scrolling text area. Chintan Thakker contributed to this section. A chapter dedicated to strings will have to wait until the 4th edition. Mike Shea contributed to this section. I have no idea how they came up with this method name, or what its supposed to refer to. But its reassuring to know that whoever comes up with nonintuitive method names is still employed at Sun. And that their apparent policy of not reviewing code designs is still in place. Sorry for the sarcasm, but this kind of thing gets tiresome after a few years.